Go to the Library's RBdigital page. Create an account with a current email address. Click on the Register link located in the upper right hand corner. Enter your Public Library card number, choose a User Name and Password, enter your name, email address, and zip code, then click Register. For more information about registering, click here. Click the Sign In link located in the upper right hand corner to access your newly-created account. Once logged in, find titles either in the audiobook or magazine section. Log in to RBdigital account using your email and password. Click on a book cover image for audio samples, to checkout, or to place a hold. Checkout period is 3 weeks and titles can be renewed up to 3 times if there are not customer holds on the title. 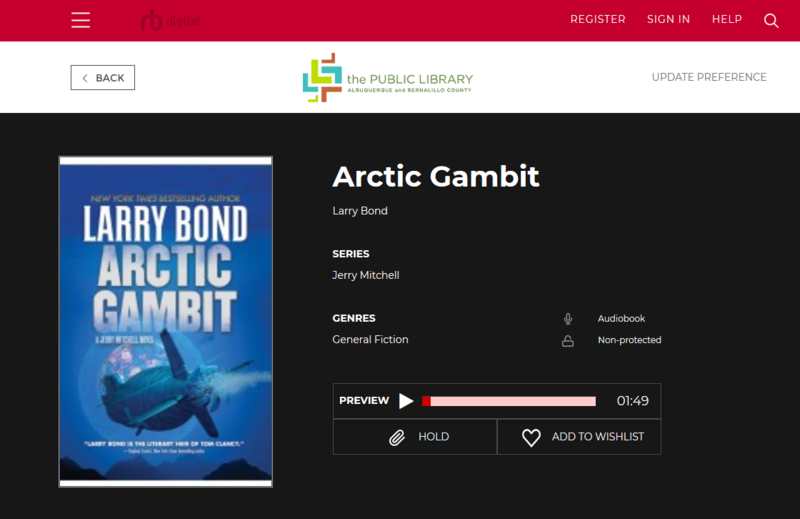 Place a hold on an audiobook or title with the hold button when another patron has the title checked out or if you have reached the maximum number of checkouts (12 per customer). RBdigital will automatically check out the item once available, and notify via email. Click on the magnifying glass in the upper-right corner of the screen and type in search terms by Keyword, Title, Author, and Narrator, and click the search button. Use the Advanced Search fields to perform a detailed search and find only audiobooks that are available now. Audiobooks on desktop require RBdigital Media Manager, which is available for Mac and Windows operating systems. Clicking on the link will open a dialog box with an .exe file to run on your computer, shown below. Once installed on the computer and registered with username and password, newly checked-out titles will open directly with the software. 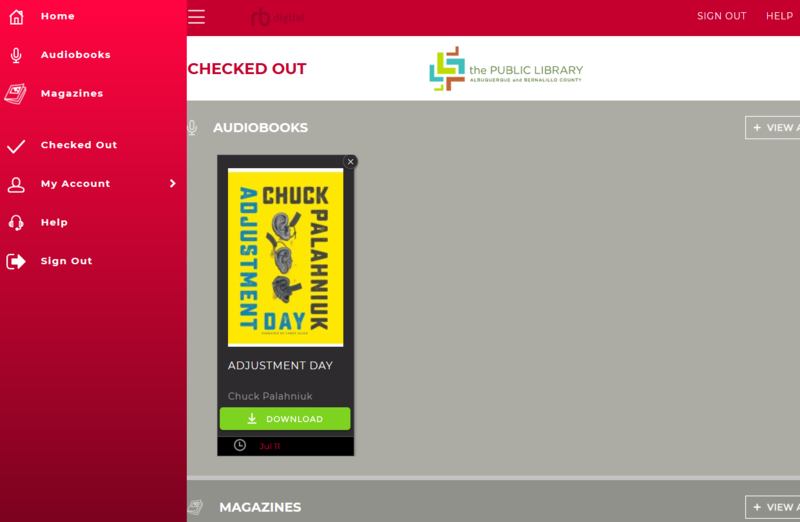 To continue reading a downloaded audiobook, access through the Media Manager rather than through the RBdigital webpage. If you are experiencing issues, you may need to download and install the newest version. View magazines in the second row of the welcome screen. Click on the cover of the magazine to view the current issue. For more details and to view previous issues available for checkout (many titles available to October 2013) scroll down and click All Issues. Return to the Public Library’sRBdigital Magazines. Click Log In at the top of the screen and enter your email and password. Click Log in. 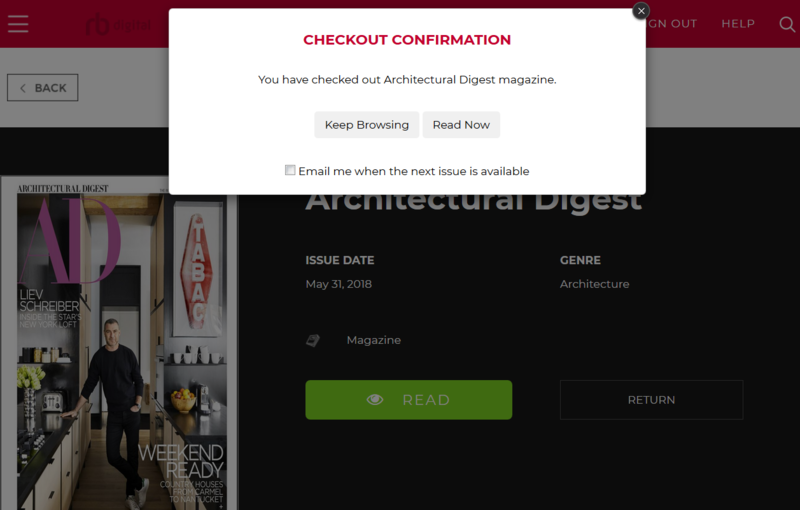 Click on the menu icon in the upper-right corner, then click Checked Out at the top of the page to view the magazines you have checked out. Click on the magazine cover to open, then click the green button to Read! To navigate forward and back in the magazine, selecting the right edge will advance the pages, and selecting the left edge will reverse. Additional controls and options are on the left side of the page and available from the right click menu. Click on the menu icon in the upper-right corner, then click Checked Out. Click the Return button adjacent to the title/issue that you would like to remove. Printing is available when reading a magazine on desktop. Options are determined by the publisher of the individual magazine; users may be permitted to print a single page, a range, or none at all. In your RBdigital account, click on the menu icon in the upper-right corner, then click Checked Out and select the magazine you wish to print from. Go to the page you wish to print. Click the Print icon from the tools on the left of the page. Click on the Help tab in RBdigital. You will find video tutorials, help on devices, as well as FAQs for eAudiobooks and Magazines. Contact RBdigital via email or phone. Customer Service Representatives are available to assist you from Monday through Friday 7:00 a.m. to 3:00 p.m.